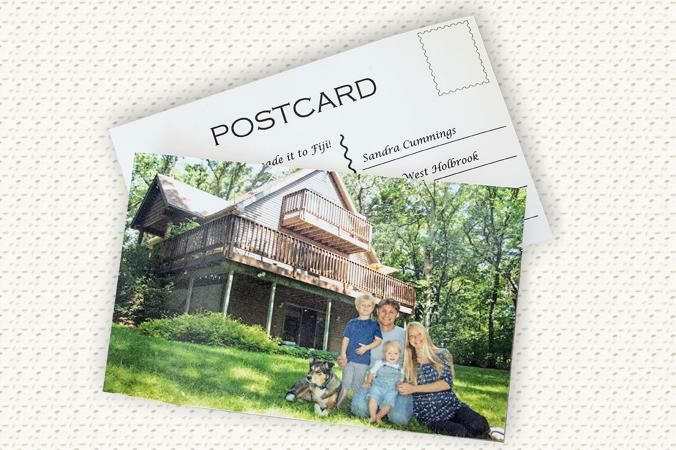 You can save money and show off your crafting skills by making your own postcards. As long as they fit within certain requirements, postcards are more affordable to mail than traditional letters, and they also offer lots of fun ways to express your creativity. Use one or both of these printable templates to create your own unique postcards. You can customize the cards before printing with your own images and text, or opt to add them afterwards instead. This smaller postcard template is a great choice if you don't want to use a large image. It fits within the legal requirements for postcard size and has plenty of space to write a short message. Try this larger size of postcard if you want to have a little more space for pictures or text. It's still within the legal requirements set by the USPS. These cute postcards are standard size and come with either script font or lage block font. Click on the image of the template you want to use and download it to your computer. If you need assistance, try these helpful tips for using free downloads. 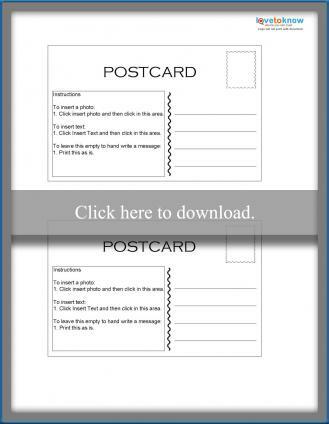 Add an image or text to the postcard template, or leave it blank to write your own message by hand. 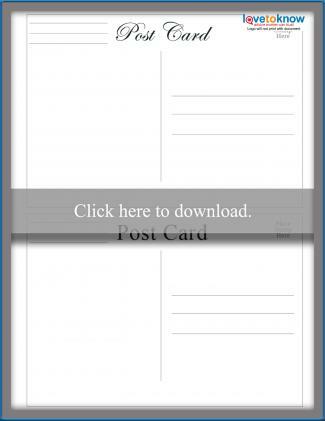 If you choose, add images to the front of the card, shown on the second page of the template. Load cardstock into your printer. Print the first page at actual size. Remove the cardstock from the printer and reload. Print the second page, also at actual size. Cut out the postcard using scissors, a paper cutter, or a rotary cutter and ruler. 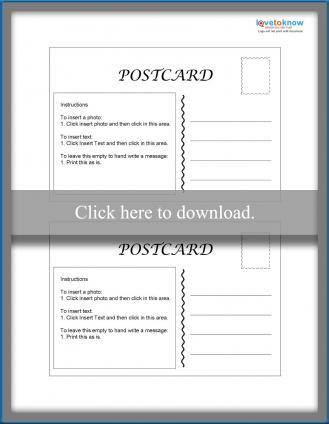 You can use templates to make your own postcards or create your own designs. Either way, you'll need to follow a few basic rules set by the United States Postal Service (USPS). Otherwise, you'll need to pay more to mail it, or you may not be able to mail it at all. Thickness - Print your card on cardstock that is between 0.007 and 0.016 inches thick. This translates to between 7pt and 16pt cardstock. 14pt is a good choice for most cards, however you should go with something thinner if you'll be using multiple layers. Length - Your card must be between five and six inches long as measured on the side of the card that is parallel to the address. Height - Your postcard must be no shorter than 3.5 inches and no taller than 4.25 inches as measured on the side perpendicular to the address. Shape - Your postcard must be rectangular. Although it's tempting to use those fancy scissors, stick to a simple straight cut. Make a wedding or graduation announcement by printing a photo on one side of the card and a brief message on the reverse. Send children's art work to grandparents by having them draw or write on blank cardstock. Cut it to the appropriate dimensions and write the address on the back. Use rubber stamps to create a gorgeous design on the front of the card while writing your message and the address on the back. Glue or print a map on the front of the card and circle the location of your new house. Write your new address on the back, along with the address of the recipient. Make the front of the card out of beautiful scrapbook paper. The card has to have uniform thickness, which means you can't have embellishments that don't cover the entire card. You can use stickers on your card, but they must be adhered with permanent glue. You can use two layers of paper on your card, but they must be permanently glued together. You can't use any attachments or embellishments that are made from materials besides paper. Every attachment has to be completely glued to the card. If you make your own postcards with or without a template, you'll need to walk the line between creativity and adherence to the rules. Before you mail your card, double-check that it follows the guidelines of the USPS. If not, your card may never reach its destination.